Big Nog in the house! Ultimate Fighting Championship (UFC) held a special media day on Tuesday (March 20) to help promote the women’s bantamweight title fight between current division champion Amanda Nunes and top contender Raquel Pennington, who collide in the upcoming UFC 224 pay-per-view (PPV) main event on May 12 in Rio de Janeiro, Brazil. Nunes (15-4) hasn’t competed since Sept. of 2017 where she outpointed Valentina Shevchenko at UFC 215. Prior to that, “Lioness” had an even better showing by knocking out former division titleholder Ronda Rousey in under two minutes. Hear “Rowdy’s” take on that loss here. As for Pennington (9-5), she fought her way up the 135-pound ladder by winning four in a row and hasn’t tasted defeat since dropping a close split-decision to another former champion, Holly Holm, way back in 2015. The winner could be in line for this super fight. To see who else is competing at the upcoming UFC 224 combat sports extravaganza, which also features the all-Brazilian co-main event between former champions Vitor Belfort and Lyoto Machida, click here. Despite Dana White all but confirming a super fight between Amanda Nunes and Cris Cyborg, that bout, for now, will have to wait after the Ultimate Fighting Championship officially announced that Nunes will instead defend her bantamweight belt against No. 8 ranked Raquel Pennington. A proposed bantamweight title bout between Amanda Nunes and Raquel Pennington at UFC 219 won’t be happening — at least not until 2018. 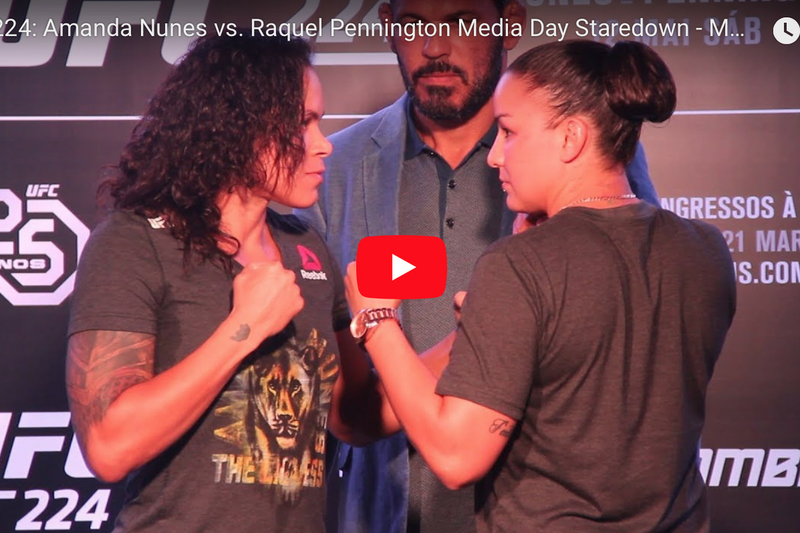 The post Raquel Pennington Won’t Be Challenging Amanda Nunes Anytime Soon appeared first on Caged Insider. There might be a pair of Penningtons making noise in two UFC divisions before long. UFC fighters Tecia Torres and Raquel Pennington got engaged to be married Saturday, Torres announced on Instagram. The two, who have been dating since last year, recently bought a home together in Pennington’s home state of Colorado. Torres wrote posted a picture of Pennington down on one knee. Pennington also posted a picture of the moment, ring in hand. Torres, 27, is a top contender in the UFC women’s strawweight division, most recently defeating Bec Rawlings in February by unanimous decision. “Tiny Tornado” also earned her Master’s degree in criminology from Florida Atlantic University last week. Pennington, 28, is on a four-fight winning streak, including a unanimous decision win over Miesha Tate at UFC 205 last November. “Rocky” could be nearing a title shot with another victory.